Black and white negative of members of the Public Utilities Commission at the sod-turning ceremony for the new building for the Whitby Public Utilities Commission. The men are standing in front of a digger and two men hold a shovel and a pick axe. 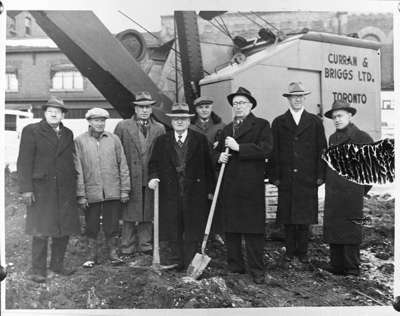 From left to right: Herbert Pringle, J.J. McLaren (Superintendent for Curran & Briggs contractors), James Ross, Fred Rowe, Garnet Thompson (General contractor), William Davidson (Mayor), William Pringle, Dave Mowat. The new office for the Whitby Public Utilities Commission was built in 1948-1949 at 128 Brock Street South, the north-west corner of Brock and Colborne Streets. Construction of the Public Utilities Commission Office, 1948, Marjorie Ruddy. Whitby Archives 08-006-021.